The death of Muammar al-Qaddafi and the end of his rule in Libya marks the end of an era. Our untiring colleague in International History, Jeremi Suri, blogs about the historical background. More historical perspective, in particular about the backseat role the US played in these events, can be found at NPR’s website. And on the photoblog of The Atlantic is a collection of photographs from the last battles. 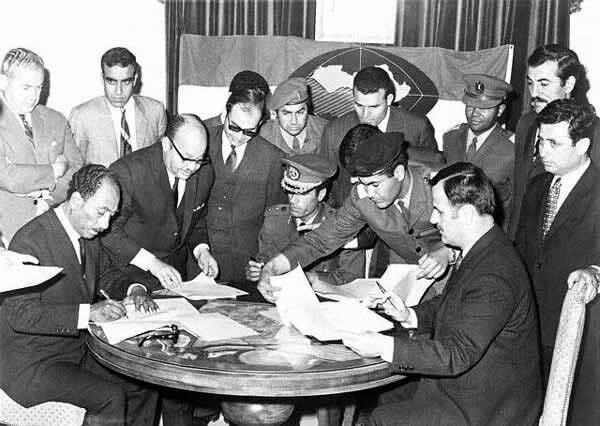 Syria´s President Hafez al-Asad (sitting on the right side) signing the Federation of Arab Republics in Benghazi, Libya, on April 18, 1971 with President Anwar al-Sadat (stting left) of Egypt and Colonel Muammar al-Qaddafi of Libya (sitting in the centre). The agreement never materialized into a federal union between the three Arab states. For more on and by Jeremi Suri, see his website, which begins with another version of this article.